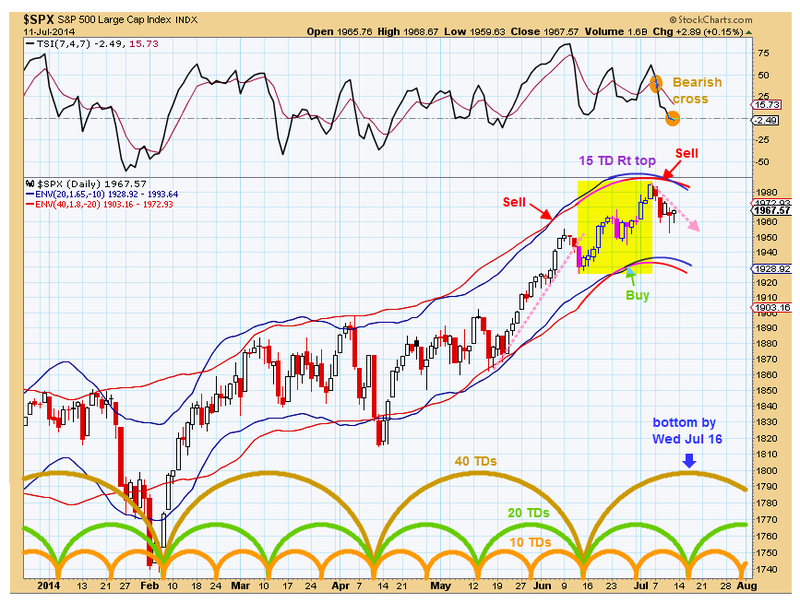 - short term 10TD cycle should bottom along with 20TD cycle mid week (WED +/- 1 day. Probably no more than 1% downside over next 2-3 days. 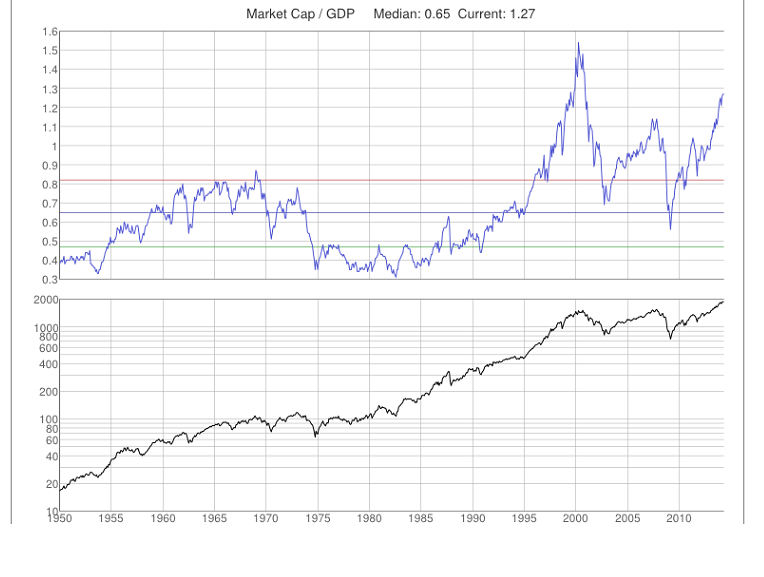 Warren Buffett's favorite measure of over valuation is when the value of the total market index exceeds the GDP. We have reached that level, so maybe just a matter of when the market corrects? July 20 is this Sunday which means if the 2009 bull market top wasn't already seen on 7/3/14 then it should be expected this week. Hello, I love your blog. Great job! I am new to cycles and would like to know more. I use Thinkorswim. How do you determine the length of cycles you draw? What does "TDs" stand for, trading days? Congratulations for this great analysis and approach. I discovered your blog a week ago and your work inspired me to order the book on Kress cycles. Maybe I am wrong, but I think I noticed that your cycles do not follow exactly the cycle calendar in that book. For example, your cycles bottomed on 4 April (important exact top) while the bottom in April according to the book is a few later. Again, I might be wrong, your weekly and monthly cycles are not exactly the same with those in the book. I would appreciate your comments. Please keep the wonderful job going on. Palobar - I feel the cycles used by most followers off cycles are guide lines. I try to use those guidelines and then interpret data based on those guidelines. Sometimes there will be some variation from commonly accepted cycle lengths. For swing trade I normally stick to shorter cycles (usually 10 TDs (Trading Days / 2 weeks)).to around 100 TDs (20 weeks - 4 1/2 months. This cycle seems to be running short last year or so). Occasionally I look at longer cycles for context. I see there is something called "ENV" on the chart/ What is it? Thanks. John - ENV stands for envelope. These are channels enveloping the prices (offset by 1/2 the MA used to construct the envelope). Crossing of the upper and lower envelope lines of the different length MA envelopes generate buy/sell signals. Width of the envelopes is somewhat trial/error to get a good fit. See blog "practical technical analysis" as he sometimes posts Hurst (JM Hurst was a pioneer of cycles) cycles.